Ever wondered what your neighborhood looked like in the 1930s, or how you can help to reimagine where you live today? Portions of a rediscovered scale model of San Francisco from 1938 with 6,000 city blocks, are coming to a branch near you. Organized as part of Public Knowledge, the Library’s partnership with the San Francisco Museum of Modern Art (SFMOMA), Take Part is an exhibition conceived by Dutch artist duo Bik Van der Pol in collaboration with over a hundred local librarians, historians, geographers, cartographers, urban planners, artists and designers. The scale model is a detailed wooden replica of San Francisco at a scale of 1 inch: 100 feet. Built by the WPA, it was first displayed during the Golden Gate International Exposition on Treasure Island in 1939, and then at City Hall in 1940. Made to be a planning tool, a tourist attraction and for educational purposes, the model has largely been in storage for decades. 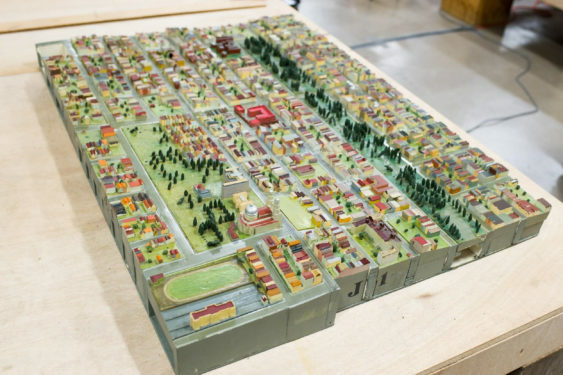 Beginning January 25, 2019, Take Part will reunite the model with the public, as sections of the scale model will be featured at the Main Library and at all branches including the SFMOMA’s Public Knowledge Library, as a catalyst for conversation and events about San Francisco’s past, present and future—its challenges and opportunities. 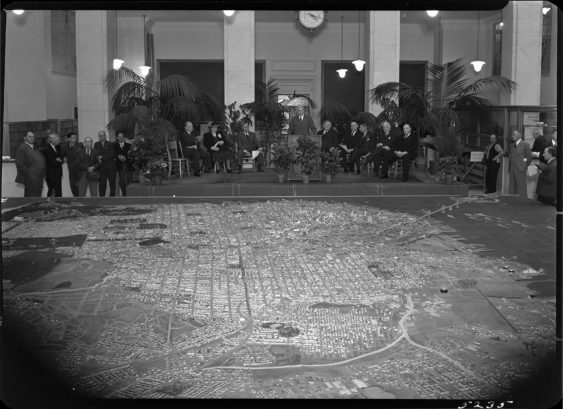 70 of the 140 sections of the 1938 Scale Model of San Francisco are on view at the twenty-nine branches of the San Francisco Public Library from January 25 – April 28, 2019. Use the map below to find out what is on view. A final phase of the project, later in 2019 or 2020, will bring the whole scale model together into public view. Sign the petition to show your support for finding a place to display the model all together. Join in for more than 100 related programs and activities for all ages at library locations across the city, including SFMOMA’s Public Knowledge Library, through March 25. Visitaion Valley Walking Tour, January 26, 10 a.m. Build It LEGO City, West Portal Branch, January 26, 3 p.m.
Engineering Marvels of the WPA, Marina Branch, January 26, 11 a.m.
Community Building Blocks: The Past and Future of Organizing, Richmond Branch, February 6, 6 p.m.
Mapping Our Memories, Western Addition Branch, February 9, 11 a.m.
Mural Workshop for Kids with Precita Eyes, Mission Branch, February 9, 11 a.m.
Genealogy & Family History Class, North Beach Branch, February 12, 6:15 p.m. Yes, I Live Here! Excelsior Branch, February 12, 6 p.m.
What is a Map? Merced Branch, February 16, 2 p.m.
Westwood Park: Building a Bungalow Neighborhood in San Francisco, Ingleside Branch, February 16, 1 p.m.
Vanished Waters: A History of San Francisco’s Mission Bay, Mission Bay Branch, February 20, 6 p.m. The Remarkable Forgotten Histories of San Francisco’s Glen Park, a Suburban District in the Heart of San Francisco, Glen Park Branch, February 21, 6 p.m.
Hills, Sunlight, and Shadows: Decisions that Shape Downtown, SFMOMA Branch, February 21, 7 p.m.
Make a West Portal Zine! West Portal Branch, February 24, 2 p.m. Intrigue and Art at the Expo – A Celebration of the 80th Anniversary of the Golden Gate International Exposition, Main Library, February 23, 2 p.m.
City Guide Tour: Billionaire’s Row, Presidio Branch, February 23, 2 p.m.
San Francisco’s 49-Mile Scenic Drive: A Virtual Tour, Ortega Branch, March 6, 7 p.m.
San Francisco is increasingly at the center of the technological revolution that began in Silicon Valley. In this session, explore the impact of the riches brought in by that sector on the people and landscapes of the city. What groups, skills, and lifestyles are now missing from the urban environment? What has emerged instead? How has this reshaped the area? What are the consequences for the city as a whole?